Ever wondered what’s in the Stettin archives? 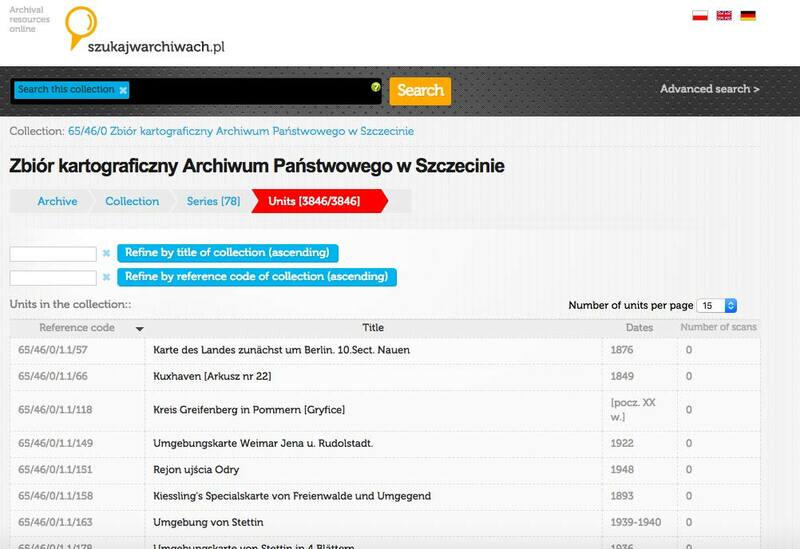 It’s been difficult to determine exactly what is stored in Szczecin unless you speak either German or Polish or have the money to hire a professional researcher. As always, my goal with this website is to help give you more control over how to research your family’s history. First, the reason we are discussing the archives in Stettin is because it’s supposed to house important records that are over 100 years old. Depending on the location for your research, the files may also be stored in Köslin or Greifswald. As a general rule, the oldest documents are supposed to be transferred from local repositories to larger state archives. Determining which archives currently contain any given collection can be a nightmare if you don’t know where the files are stored. Thankfully, an inventory exists for Stettin to help take out some of the work involved. The collections for Köslin are not as easy to parse through, and as to what is held in the Landesarchiv Greifswald–good luck finding out. There are two websites that will be of the utmost help: BKGE.de (Bundesinstitut für Kultur und Geschichte der Deutschen im östlichen Europa) and SzukajwArchiwach.pl. It is also helpful to use Google Chrome as your browser as you can right-click to translate any page into English. I started doing family history just before translation and genealogy resources started to boom. Currently, Google’s translation algorithms do a bang-up job and have come a long way. 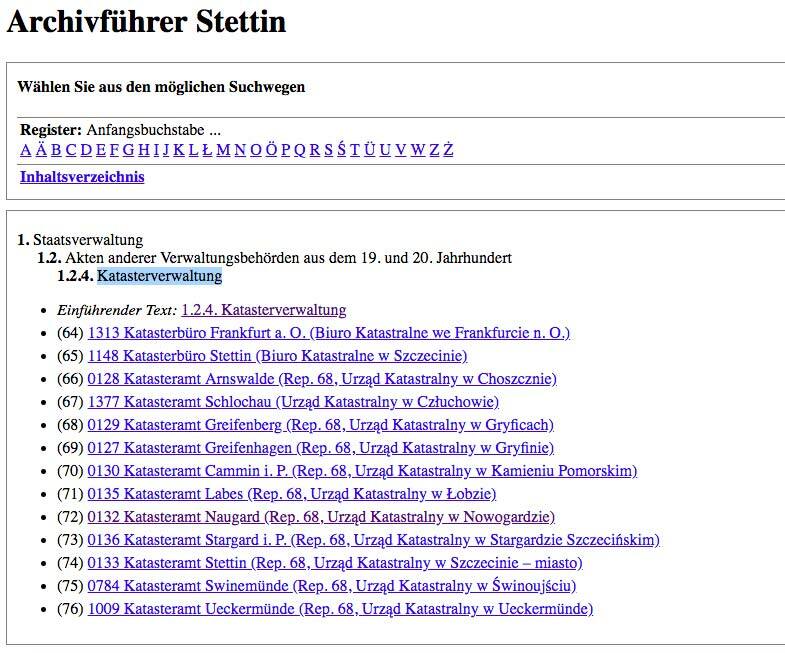 To start with, BKGE lists the entire inventory in Stettin in great detail. The outline is easy to navigate. However, the collections are somewhat confusing. For example, guild records are fragmented between several different collections. I’m not certain why this is the case. While it makes the search more tedious, the organization on this website should help immensely. The file structure is the same as how the documents are stored within the archive. BKGE gives overview details to what is in each collection within the inventory without listing each book separately. This is where Szukaj w Archiwach comes in. There are multiple ways to search for a book or a collection. The first step is to zero in on the archive. When requesting books for research, it is imperative to have the book’s call number to ensure you are obtaining the correct records. As shown below, you will want to click on the “Advanced Search” button. You can also choose your language preference by clicking on the flags in the upper-right hand corner. This only applies to the interface and will not translate titles of books for you. Once you see the page shown below, you will need to select the correct archive. 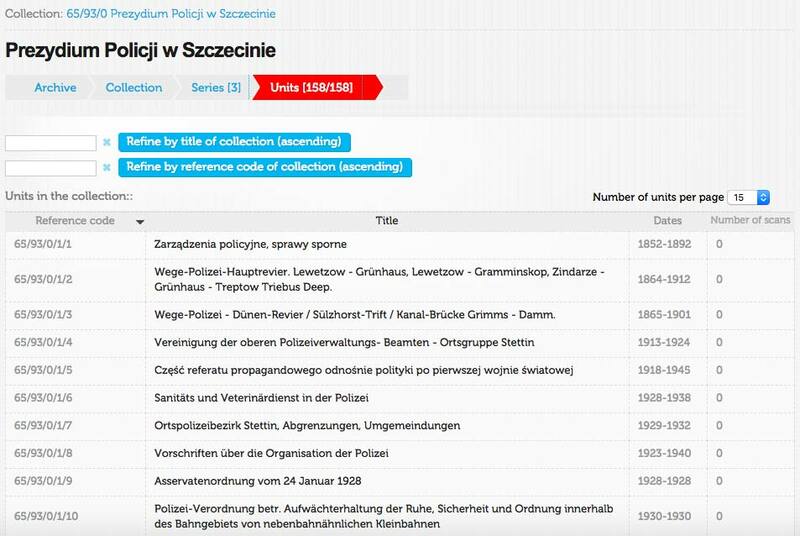 You can choose multiple if you would like, but BKGE only lists the collections in the Szczecin State Archives. From here, you will want to make sure the red “Collections” box is checked if you are looking only for titles of larger collections. Then click “Refine.” This helps narrow down the pool from hundreds of possibilities to a few. Within collections, you will be able to navigate as you would from BKGE. If you don’t see any results after several searches, you may want to leave the “Collections” box unchecked. Okay, so now what? Let’s pretend I read through the pages on BKGE and determined the collection I need is in the “Katasterverwaltung” inventory. I would search for that term in Szukaj w Archiwach. The images below will show how the guides appear on both websites and how you can use them to your advantage. Both of the images above show the exact same collection. Sometimes, a call number can be found on BKGE and is helpful with the search. Remember, the collections are supposed to be stored in almost identical file trees. However, more often than not, top-level titles are written in Polish while actual collection items are shown with their German titles. This is where dates become exceptionally useful to determine which is actually the correct collection. The image below shows the collection filtered by units, although filtering by series can be particularly useful if there are similar items you would like to explore. The images show best-case scenarios. But how about when you can’t find a given collection? The best thing to do in this case is to copy the call number into the web address. szukajwarchiwach.pl/65/XXXX/0/ You will want to copy the reference number found in the collection to replace the X’s in this web address. This is the easiest and most surefire way to ensure you truly have the right collection. The image below shows a top/bottom comparison. The image below shows the typical location of the reference number. Notice that there are three series within collection 0093 (not “11”) with a total of 158 units. It is not just one book. The collection is comprised of numerous books which can be further explored to gain more insight into which resources still exist today. 1. Druidenloge „Wiking zur Guten Fahrt“ (Swinemünde), Verordnungen der Freimaurer in Deutschland, Sitzungsprotokolle, aus den Jahren 1843–1926, 2 AE. When searching for “Druidenloge” with collections checked, the only result that comes up is the collection “Stowarzyszenia i organizacje niemieckie na Pomorzu.” However, when searching inside the series tab, I can find “Druidenloge “Wiking zur guten Fahrt” Swinemünde” as the eighth item listed. But is it the right records collection?. The dates on Szukaj w Archiwach show 1920-1926. After further examination of the file inside of that collection, it turns out that the dates covered are 1843-1858, though the “date of creation” is from 1920-1926. 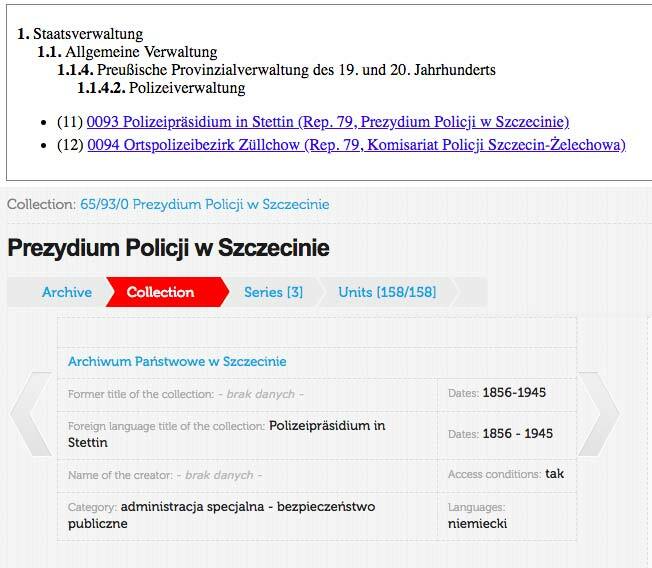 When pasting “Cech Rzemiosł Różnych” into Szukaj w Archiwach, the correct collection appears. However, the file is described in the collection but is nowhere to be found within the series. Under the baker’s guild, one can find “Das Fünf Amter Chor.” It’s quite possible a mistake was made when the data was entered and filed. The Polish description translates to: “7. Guild of Various Crafts 1575-1914; ref. 18-37; 20 j.a. – privileges for guilds of tailors and blacksmiths, provisions on wages in the trade, bills and general information about the bricklayers ‘guild, comb producers, master exams, painters’ statutes, carpenter’s accounts, guild rules, journeyman journeys.” These details would make for a highly interesting research project with these files, if they could be found. Using the reference codes 18-37, it appears that this collection is actually made of multiple collections. This still does not explain the date discrepancy of 1575, though. And if possible misfilings weren’t confusing enough, there are several other locations for guilds within Belgard, including the Landratsamt and in several other collections concerning industry and handwork. No, it’s not just translation errors from German to Polish. Sometimes book titles were spelled incorrectly by modern perception since the language at the time had not been modernized. The letter K could be a C. City names could have multiple spellings: Lülfitz, Lülwitz… Kolberg, Colberg, Cholberg, etc. This is why the search can be made easier by utilizing the finding aids as they narrow down places based upon location. While the archives in Stettin hold much promise for unlocking the secrets of your family history and the places they came from, their archives are only a fragment of what can be discovered in other archives as well. 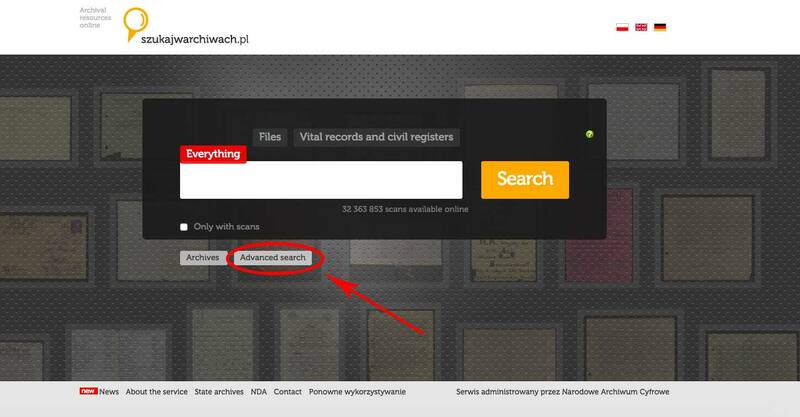 If you cannot find what you are looking for by searching through these finding aids, it is possible that the collection lies in Koszalin or in Greifswald, or even possibly in another German archive. For further reading and to consider alternatives for researching when one door closes, please see our Searchable Databases page. I founded this website to help others make connections with their genealogy. I've been at my own family history since 2014 and have made significant progress since then. My hope is to one day determine where my family name came from. In the years since I started my genealogy, I've become something of an expert on the resources and history of Pomerania. I'd like to share what I've learned with you to help you on your own journey to discover your heritage. With the right information and enough patience, I believe researchers like us can break down the barriers to our family histories and make more freely available so others can trace their families as well. Let's work together to rebuild the stories of our ancestors!